I'm so sad that these products are being retired - they've been a wonderful and versatile addition to my stash this Christmas! Now that I know they won't be around much longer, I'm using them mor than ever! If you don't have these sets yet, and would like them, it might be a good idea to buy them as soon as you can in case stock runs out. 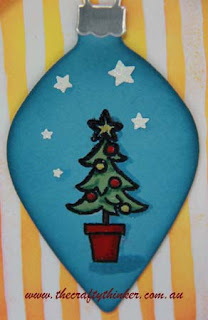 Just click on the image of the product at the bottom of this post - it'll link you to my shop. The greeting is from the To You & Yours Too set which is also retiring. If you'd like more information about retiring products or if there's anything else you'd like to ask me - please contact me. 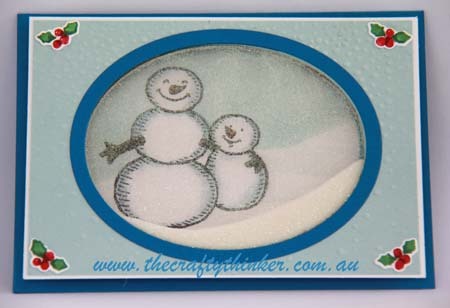 Labels: Centre Step Card, Christmas Card, Festive Fireplace, Sleigh Ride Edgelits, Sponged sky, Stampin' Up! I came over all adventurous yesterday and made my first shaker card! I've been thinking of improvements ever since but, meanwhile - here it is! 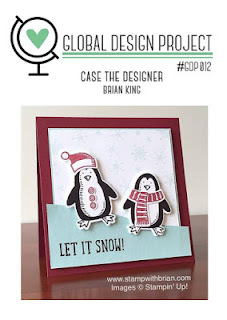 I have decided to enter it into this week's Global Design Project #GDP012 since Brian King's lovely card inspired me to use the Snow Place stamp set. I've called it my Snowmum card because of the comforting arm/stick around the little snowman. My niece had been visiting with her new baby and all the cuteness must have affected me! Labels: Christmas Card, masking technique, Shaker Card, Snow Place, Softly Falling Embossing Folder, Sponging, Stampin' Up! 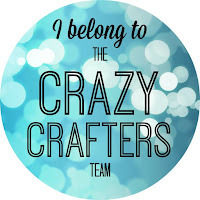 Welcome to the Crazy Crafters Blog Hop for November. 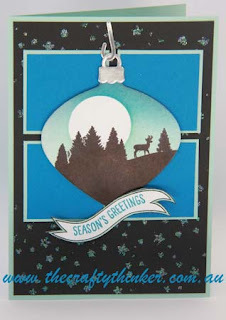 This month we are showcasing our most used stamp set! We hope you like our choices and find great inspiration from the projects. 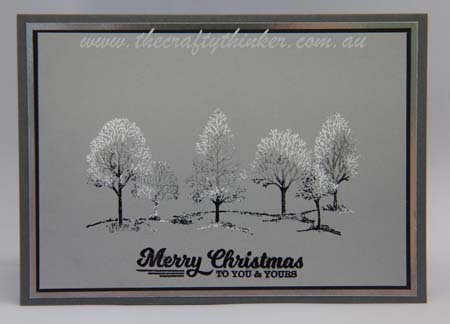 My most used stamp set would have to be Lovely As A Tree! It was my first stamp set purchase and remains one of my all-time favourites! 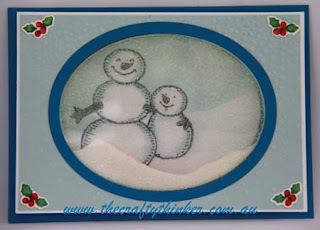 It really gets a work-out because it's just so versatile - it's equally suitable for Christmas cards, birthday cards (masculine or feminine), sympathy cards ... pretty much everything really and it also lends itself very well to many different techniques and so it can look very different, depending on the techniques and/or colours you use. 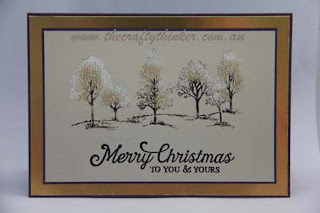 I created these cards by "painting" with embossing powders - and a lot of fun it was too! 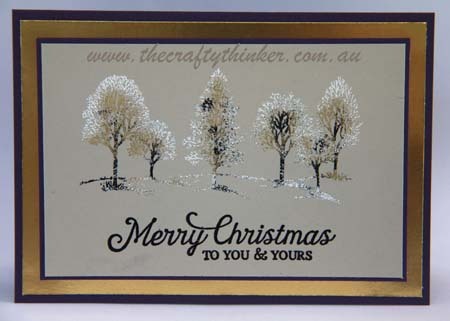 First I stamped the image with Versamark and then I very carefully sprinkled small amounts of three different embossing powders roughly where I thought I'd like them. I tipped the card down to remove the excess powder and so the tops of the trees remained very white and little bit of "snow" fell onto the ground too. Then I tapped off any excess and used the heat tool. 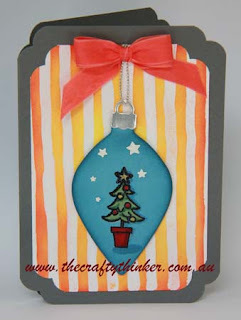 For a great tutorial on the technique see Sandi McIver's PDF here. In this one, I used black, gold and white on Sahara Sand cardstock which I layered with Elegant Eggplant and Gold Foil cardstock. 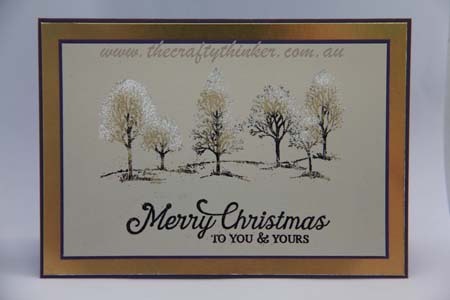 I wanted the tree trunks and bases of the trees to be darker and the tops of the trees to be lighter and so I concentrated my embossing powders accordingly. 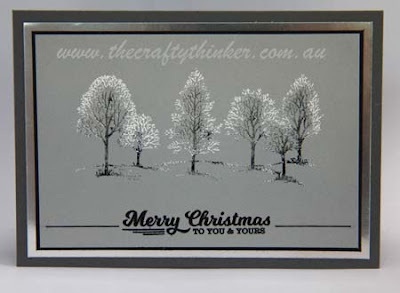 For this card, I used black, silver and white embossing powders on smoky slate cardstock (layered with black, Basic Grey and Silver Foil cardstock). 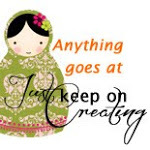 One of the joys (and sometimes frustrations!) of this technique is that it looks different every time! 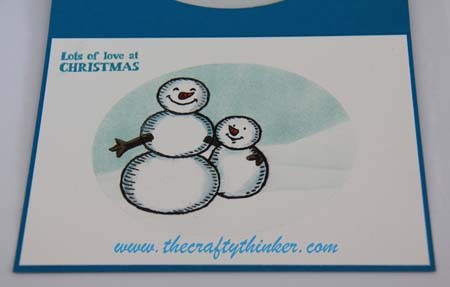 Here are a couple of other cards to show you what I mean. Time is not my friend at the moment so I was very excited to complete a card to enter into the latest Global Design Project challenge! 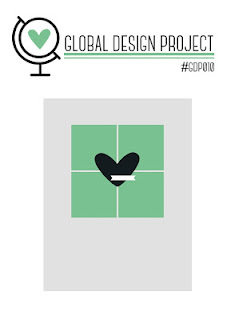 This is GDP010 - click the image for the link to join in or see all the lovely entries. 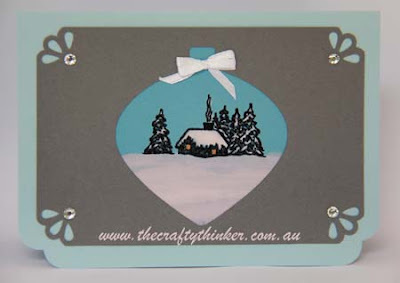 And this is my card using the To You &Yours Too stamp set, some masking and sponging. 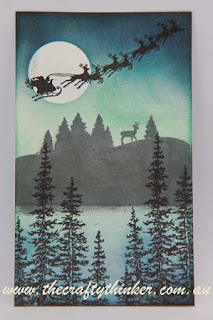 To go with the moonlight theme, I stamped the black cardstock with versamark using the little stars from the stamp set and heat embossed with Heat & Stick before sprinkling with Dazzling Diamonds glitter. I masked the moon with a circle of scrap paper (I made it sticky but removable with some 2-Way glue) before sponging with Soft Sky, Pool Party, Pacific Point, Night of Navy and a tiny touch of black. Then I removed the mask and stamped the main image from the stamp set with Archival black ink. I then cut out the image with one of the Delicate Ornament Thinlits and sponged the edge with a little black. The ornament top and hook are cut from Silver Foil with dies from the same set. I stamped the banner from the Project Life Hello December 2015 stamp set and coloured between the lines with my Pool Party Stampin' write marker (although it's a bit hard to see in the photo). I manipulated the photopolymer greeting from the Happy Scenes stamp set so that it followed the shape of the banner and stamped with Pacific Point ink. Then I fussy cut the banner. The squares are Pacific Point cardstock layered onto Pool Party. The main card is also Pool Party. 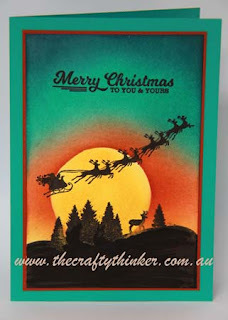 I had so much fun with this that I went on to make several more cards using the same stamp set and similar technique: some sunsets and some moonlight. 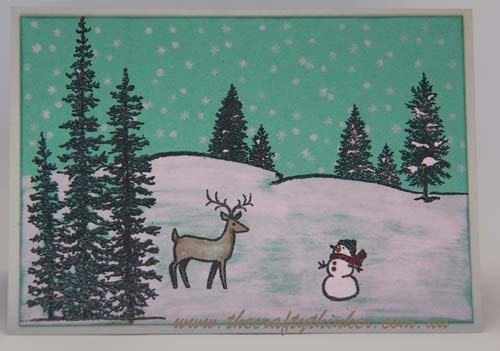 I added the sled & reindeer image from Cozy Christmas and to some of them I added the trees from the Wonderland stamp set.